I cannot express how important this rule is to understand, as it provides a lot of the logic in why joint articulations work well… and why pathology can occur when altered (described in my impingement/instability articles). Understand that one bone is always ‘fixated’ and one bone is in motion. I advise always-always-always focus on the bone in motion. Take the same convex femur and concave tibia. This time the tibia is fixated, and its the femur which moves. 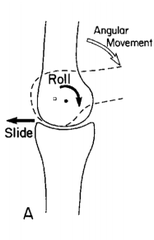 The femur is CONVEX, so its surface will slide in the OPPOSITE direction to the femur movement (picture 3). Why is there a convex-concave rule? 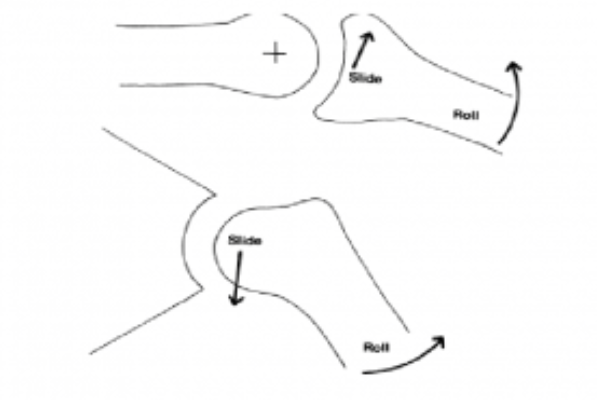 Its all about which bone contains the axis of rotation. In a convex bone (humeral head) it rotates around the axis which is WITHIN its head. In a concave bone the axis is inside the other ‘fixated’ bone. I hope this explains things clearly… like mentioned in my Impingement and Instability articles, it gives some explanation to the pathological movements of the humeral head which ‘decentralise’ it. Did you find this useful? Join the Facebook pages to the right for daily posts to help boost your physio knowledge. Excellent explanation, better that my kine teacher. He make those rules hard to get. He said to me that the humerus head is NOT convex ….. I have no idea why?? That makes me feel totally lost.